From Steam to Gasoline: The Tractor! There are few inventions in history that have literally changed the landscape like the modern tractor. Steam locomotives were being primitively built as early as the late 1700s in Europe and then America, but it wasn’t until the mid 1800s that steam technology was applied to “Locomobiles” or traction engines (tractor for short!). These early replacements for draft horses were incredible inventions, but also proved to be slow, heavy, and cumbersome. This is where the story of the tractor takes an interesting turn on a little road in Northeast Iowa. John Froelich was born November 24, 1849 in Giard, Iowa. The first of nine children born to German settlers Johannes Heinrich (Henry) Froelich and Kathryn Gutheil, his life work went far beyond the typical farm – he operated a grain elevator near Froelich, Iowa and ran a threshing operation in Langford, South Dakota. As the story goes, John Froelich was fascinated by steam-driven machinery and farm implements. And not only that: he also worked on them and understood their weaknesses. In 1890 Froelich purchased a gasoline internal combustion engine from the Van Duzen Engine Works in Cincinnati, Ohio, to run his grain elevator. While working with the engine at his elevator he began to tinker with the idea of using the gasoline engine to power a traction engine. In 1892 Froelich mounted a single-cylinder Van Duzen engine on a Robinson chassis with a traction system of his own design and thus created the very first internal combustion-powered tractor that moved forward and backward, and could also power a threshing machine. Froelich’s sidekick and assistant, William Mann, helped him transport the machine by rail to their South Dakota operation and proceeded to use it to power their J.I. Case threshing machine through 72,000 bushels of grain in 52 days. On the heels of this accomplishment, a group of investors backed Froelich and formed the Waterloo Gasoline Traction Engine Company in 1893. But unfortunately they only built four of Froelich’s tractors – two of which were returned by unsatisfied customers. In 1895 the company became the Waterloo Gasoline Engine Company and went to work building small stationary gas engines for such uses as pumping water and powering grain elevators. 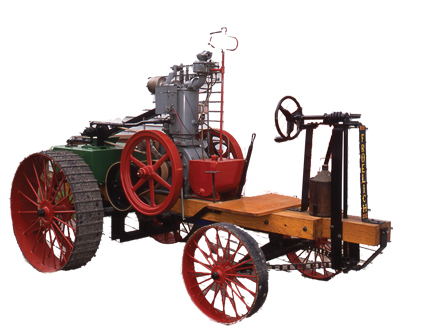 Froelich soon left the company and the Waterloo Company changed hands more than once in the early 1900s, but eventually began to produce the “Waterloo Boy” gas engine farm tractors, a design much like the one John Froelich brought to the company more than a decade before. By 1918, Waterloo Boy had produced three models of the tractor including the LA, R, and N models with over 8,000 tractors sold. In 1918, The John Deere Company in Moline made a bid of $2.2 million dollars to acquire the Waterloo Boy Tractor Company, thus taking on the most successful modern tractor company of its time, and all of this built off of John Froelich’s original design for the gasoline internal combustion traction engine. John Froelich went on from his early tractor-building endeavor to create engines at the Novelty Iron Work in Dubuque, and then worked with his brother Gottlieb in manufacturing before moving to St. Paul. He was a life-long inventor, credited with such things as a washing machine, dish washer and dryer, a mechanical corn picker, and the first air conditioner that later became the Carrier Air Conditioning Company. In the late 1920 Froelich caught some more bad luck working in the investment world. The great crash of 1929 wiped out much of his livelihood and savings and he spent the final years of his life with his daughter, Jenetie, in St. Paul where he passed away in 1933. He was never recognized for his inventions until decades later. Froelich was inducted into the Iowa Inventors Hall of Fame in 1991. To this day, his name sits on the sidelines in the history of the common farm tractor, but it was indeed his invention and tinkering with the old Van Duzen single cylinder engine that led to one of the world’s most important agricultural implements. “Fall-der-All” is the annual celebration of the Froelich Tractor and attractions, including the Burlingame General Store Museum, Tractor Museum, one-room country school, blacksmith shop and more. It’s an opportunity for those that love vintage farm equipment to bring their collection in and show it off,” says Froelich foundation President Denny Eilers. This year, the festival and fundraiser will take place September 26-26, with a variety of displays and activities suitable for the whole family. The Froelich Foundation board-of-directors is an all-volunteer group that manages the museum, grounds, and historic preservation of Froelich. 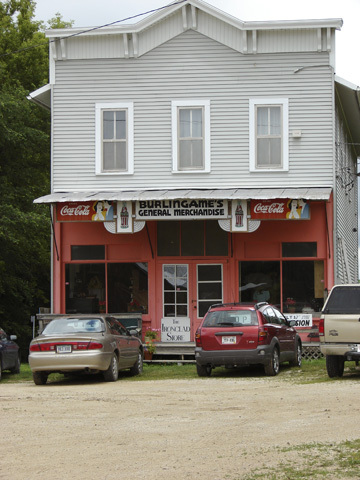 You can find out more about the story of John Froelich, the village named after his family, and the annual Fall-der-All by visiting the Village of Froelich located on Highway 18 between Monona and McGregor, Iowa – open through September from 11 am to 5 pm daily except for Wednesdays, and weekends in October. More information and history at www.froelichtractor.com or by calling (563) 536-2841. Benji Nichols has been fascinated with old tractors and single-piston-engines for as long as he can remember his Grandpa tinkering with them. He looks forward to the Froelich Fall-der-All and Hesper/Mabel Steam Engine days every fall and someday hopes to learn how to engineer steam tractors. It is worth noting that the construction of a butter figure is even more complex than you would already suspect. More than 600 pounds of low-moisture, pure-cream Iowa butter are used to cover a frame constructed of wood, metal, wire, and steel mesh. 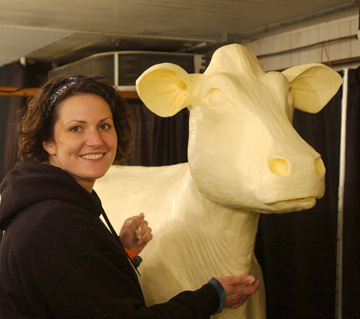 Inside a 40-degree cooler, Sarah Pratt applies layer upon layer of butter until an almost full size figure comes to life. It’s also worth noting that the butter is not wasted – in fact, it is often used to create sculptures for up to ten years – so no sneaking a taste! The Midwest Dairy Association has sponsored the attraction since 1960, and we are delighted to have had the chance to ask Pratt a few questions. I: Where did you grow up? I: How did you get involved with Norma ‘Duffy’ Lyon (Butter Sculptor for decades prior) helping to create the butter sculptures? SP:I grew up knowing Duffy and went to school with her grandkids. But it was actually a trip to the State Fair to help a friend of mine, Kari Lyon, who also happens to be the great-niece of Norma. She was showing dairy cattle and I went along to experience life in the Dairy Barn. While Kari was in the show ring I was put to work in the butter cooler, cleaning buckets and softening butter. The next year Norma called me and invited me to help again. I continued to help and Duffy trained me over the next 15 or so years. I: What’s your favorite butter sculpture or cow that you have created? SP: I enjoyed sculpting Harry Potter. There were so many fun things to incorporate from the stories. But the sculpture that I was and am the most passionate about is the piece I sculpted last year honoring Norman Borlaug. So many are unaware of his accomplishments and the difference he has made in the world! It was a privilege to share Mr. Borlaug’s story with Fairgoers. I: What else will you be carving besides the cow for the 2009 Fair? I: How long does it take you to create the sculptures? SP: I work for about three weeks before the Fair begins. I: Any comments about working with butter as a medium? Tricks of the trade? SP: At the right temperature butter is very much like clay. The trick is to get the butter to that point and keep it there. I: Anyone you’d like to acknowledge or thank? SP: I want to thank Norma for all of her support! Without her confidence in my ability I would have never believed I could do it. And of course I need to thank my husband, Andy. He is a great sounding board for ideas and has spent many hours helping me plan and build the armatures. The Iowa State Fair runs every summer in mid-August in Des Moines. And you can get in on the butter sculpting action! Submit your name for a chance to test your skills in the Butter Sculpting Competition at the fair. See you at the Fair!